This 14 day Uganda-Rwanda safari starts with rhino tracking, safari game drives in Murchison Falls National Park, Queen Elizabeth National Park, Akagera National Park, chimpanzee tracking in Kibale National Park, gorilla tracking in Bwindi Impenetrable National Park and Volcanoes National Park. The tour can also start from Kigali and end in Uganda. You can also climb a volcano or go for a nature walk or visit the endangered golden monkey. You can also climb a volcano, visit the remains of Dian Fossey’s grave or visit the endangered golden monkey. You can choose to visit and track white rhinos at Ziwa Rhino Sanctuary at $40/ per person. This sanctuary has now been established to breed black and white rhino, and restore rhino populations in Uganda's protected areas in a later stage. We will continue through the park stopping at the top of the falls which is a fantastic sight. Here the Nile, the longest river in the world, is forced through a narrow gap in the rock (only 7 meters wide), before ferociously plunging down 43 meters. From here we will continue onto our accommodation place along the Nile River. We will drive back to the lodge for lunch before taking an afternoon boat cruise to the foot of Murchison Falls. This boat trip along the Nile is often cited as being the highlight of a trip to Murchison since it allows you to get up-close and personal with the animals. Along this stretch of the river, there are reported to be around 4,000 hippos in addition to some enormous Nile crocodiles. The bird life is stunning with brightly colored kingfishers and bee-eaters darting along the riverbanks. If lucky, you may see the rare and prehistoric looking shoebill, which is a cross between the dodo and a dinosaur. The boat takes you to the base of the falls which only adds to their impressiveness. Assemble at Kanyankyu River camp at 08:00 hours to go for the most popular activity in this park which is chimpanzee tracking. Chimpanzees are man’s closest cousins though they are one of the most threatened primate species. More primates like black and white columbus monkeys, L’Hoest monkeys, grey-cheeked mangabey, red-tailed monkeys, bush babies, pottos and many bird species like the yellow spotted nicator, rumped tinker bird, Little greenbul, green breasted pitta, the crowned eagle, black bee-eater and mammals like elephants can be seen in this walk. Morning is free at ease. During the afternoon we travel to Queen Elizabeth National Park, famous for a number of wildlife like the hippos, buffaloes, elephants, kobs and a number of bird species. Queen Elizabeth National Park holds other wildlife including the predators, lion, leopard and spotted hyena. Other mammals include giant forest hog, a variety of antelope, elephant and hippo. The park’s bird species number more than 600, quite likely higher than any other destination in Africa. You shall visit the crater lakes like Lake Katwe famous for salt and continue for lunch at the lodge. After an early morning game drive, we continue to the Buhoma sector of the Bwindi Impenetrable Forest National Park. This ancient rainforest has 120 mammal species, perhaps more than any other national park in the country except Queen Elizabeth. Primates include L’Hoest’s, red-tailed, blue and colobus monkeys and the olive baboon. Antelope include bushbuck and 5 species of forest-dependent duiker. Birders come to Bwindi to seek the 23 Albertine Rift endemics which thrive here. Of those, 14 are found nowhere else in Uganda. Some 200 species of butterfly have been recorded in the park and the colourful clouds of butterflies that congregate at bush pig wallows is a marvellous spectacle. Today enjoy gorilla tracking in Bwindi. 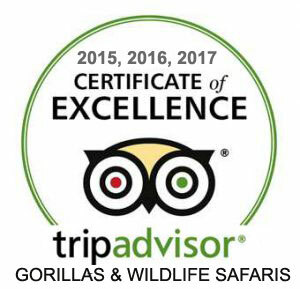 After breakfast, proceed for the morning briefing before enjoying the highlight of the trip- Gorilla trekking, which may last the entire day. We trek the gorillas through the rainforest and bamboo covered slopes, accompanied by a guide and trackers, in search of a mountain gorilla family. The walking can sometimes be tough and long, but when you catch a glimpse of the magnificent silverback, any discomforts will be quickly forgotten. When the gorillas are sighted, visitors will be guided to within 6 metres from the gorillas, sit around them for a whole hour while gazing into their big round eyes. Bwindi is a prime destination for birdwatchers. Its 350 species include seven which are IUCN red data listed and 90% of all Albertine rift species which are difficult or impossible to see in any other part of East Africa. Take breakfast and depart for Rwanda. You will cross the border via Kisoro then clear at the boarder - Rwanda is 1 hour behind Uganda. Located in the far north-west of Rwanda, the Parc des Volcans is home to the steep slopes of this wonderful mountain range – home of the rare mountain gorilla – and the rich mosaic of montane ecosystems, which cuddles evergreen and bamboo forest, open grassland, swamp and heath. You can choose to go gorilla tracking in Parc National des Volcans (subject to permit availability at the time of booking). Tracking the gorillas through the light mountain forest on the slopes of the Virungas is a magical experience. If you are lucky you can get to the gorillas, spend an hour with them, and be back at the base in time for a late lunch! Some gorilla families however are more elusive, and tracking can take a full day, especially when it is wet and muddy. You can either take a nature walk with a guide from the park, learning about the flora and fauna of the forest. Alternatively, you could go on a short trek to search for one of the troops of golden monkeys which inhabit the forest (this would need to be pre-booked, and is an additional cost). Or climb the Visoke/Muhavura volcanoes, or, if you wish, you can visit the Iby'Iwachu Cultural Village, which will give you a fascinating insight into the traditions and history of Rwanda's people., or walk to Lake Bulera. Depart for Akagera National Park, located along the Tanzanian border of Rwanda. Have lunch in Kigali then continue to Akagera. This park is famous for game drives and boat trips on Lake Ihema. The park is also known for its herds of game animals including Burchell's zebra, lions, elephants, topi, giraffes, impalas and over 425 species of birds that include the shoe bill stork, African jacana, sacred Ibis, goliath Heron, and more. After a morning breakfast enjoy a game drive in Akagera National Park. Expect to encounter some members of the Big Five including the hippos, elephants, buffaloes, etc; giraffes, warthogs, waterbucks and different antelope species. During the afternoon there will be a relaxing boat trip on Lake Ihema. Depart from the park in the afternoon to Kigali. The city tour includes the old town (Nyamirambo) and Muslim quarter, the new handicraft village and other shops, the Batwa pottery and dance centre and the Gisozi Genocide Memorial. The memorial is very moving – the tour takes a couple of hours - and will be of interest to anyone who has spent some time in this enchanting country. Afterwards you will be dropped off at Kigali Airport for your flight back home. Talk to one of our Uganda and Rwanda safaris experts to start planning your memorable safari experiences.